A Bauman Rare Books de Nova Iorque |Las Vegas | Filadelfia editou o seu October catalogue 2014. Gostaria de destacar alguns dos livros que mais me despertaram a atenção. Trata-se, como sempre, da minha leitura pessoal e, como tal, susceptível de críticas ou desacordos. Apenas, tomei uma posição, que já vem desde o início da minha apresentação dos muitos catálogos desta livraria (que é verdadeiramente uma delícia folheá-los e lê-los – confesso o meu pecado!) nunca incluir obras da temática Americana, por, no meu entender, interessar a um leque mais pequeno de coleccionadores e não ser tão generalista como todas as outras. Com isto, não quero dizer que esta não me mereça o meu respeito e admiração simplesmente prende-se com a explicação dada (e que me parece ter de ser aclarada de uma vez por todas), no entanto, todos os interessados poderão fazer a sua visualização no link para o pdf de cada um dos respectivos catálogos. 17. FAULKNER, William. The Sound and the Fury. New York, 1929. Octavo, original half white cloth, later-issue dust jacket, custom half morocco clamshell box. [$8000]. First edition of Faulkner’s masterpiece, in bright later-issue dust jacket (the first-issue dust jacket is exceptionally scarce). Book with a couple spots of soiling and slightest toning to spine, dust jacket with light wear and toning. A very good copy. 18. FAULKNER, William. Absalom, Absalom! New York, 1936. Octavo, original half green cloth. [$11,000]. Signed limited first edition, one of only 300 copies signed by Faulkner—“the greatest American novel since the turn of the century”—with folding map of Faulkner’s fictional Yoknapatawpha County. “Absalom is the peak of Faulkner’s fictional achievement” (Karl). About-fine. 65. SHAW, George Bernard. Pygmalion. London, 1913. 12mo, full burgundy morocco gilt rebacked; original blue paper wrappers bound in, custom cloth clamshell box. [$12,000]. This is a rough proof, otherwise known as a printer’s proof, which was not formally “published.” Rough proofs were made by hand used for checking purposes, prior to the publication of the formal first edition. Shaw was often inclined to keep them and give them as gifts to his closest friends. Shaw rough proofs are rare and are mainly found in institutions. During this time he also helped found The Dramatists’ Club with Shaw and became a patron of the young D.H. Lawrence” (DNB). Very nearly fine. 90. MOLIERE, Jean-Baptiste. Oeuvres de Moliere. Paris, 1734. Six volumes. Quarto, contemporary full tan calf gilt, custom slipcase. [$13,500]. Lovely quarto edition of Moliere’s works in six volumes, beautifully illustrated with frontispiece portrait and 33 copper-engraved plates, as well as numerous engraved initials, head- and tailpieces. Exquisitely bound in lovely full contemporary French calf-gilt. Text in French. Minor expert restoration to a few spine ends. Fine. 162. SEEBOHM, Henry and SHARPE, R. Bowdler, editor. A Monograph of the Turdidae. Or Family of Thrushes. London, 1898-1902. Two volumes, bound from the original parts. Folio (12 by 15 inches), contemporary full navy morocco gilt. [$15,000]. First edition, bound from the original parts, with photogravure frontispiece portrait and 149 hand-colored lithographs of thrushes by John Gerrard Keulemans, in handsome contemporary full armorial morocco-gilt. Nearly fine. 163. (AFRICA) BRUCE, James. Travels to Discover the Source of the Nile. Edinburgh, 1790. Five volumes. Thick quarto, modern half brown calf gilt. [$10,000]. Best edition of this illustrated classic of African exploration, published the same year as the first, magnificently embellished with engraved vignette title pages, three large engraved folding maps, and 58 engraved plates of scenery, antiquities, battle plans and natural history. Bruce arrived in Alexandria in June 1768 committed to discovering the source of the Nile, which he thought began somewhere in Abyssinia. In November of 1770 he found the previously unknown source of the Blue Nile, which he claimed mistakenly to be the Nile of the ancients and therefore more important than the larger White Nile. Near-fine. Mas se este catálogo já nos oferece obras de grande beleza e raridade o de November catalogue 2014 não desmerece em nada! Claro que para além das raridades de Ernest Hemingway iremos encontara obras de outros autores menos divulgados neste espaço mas de que não quero deixar cxde lhe fazer uma referência. 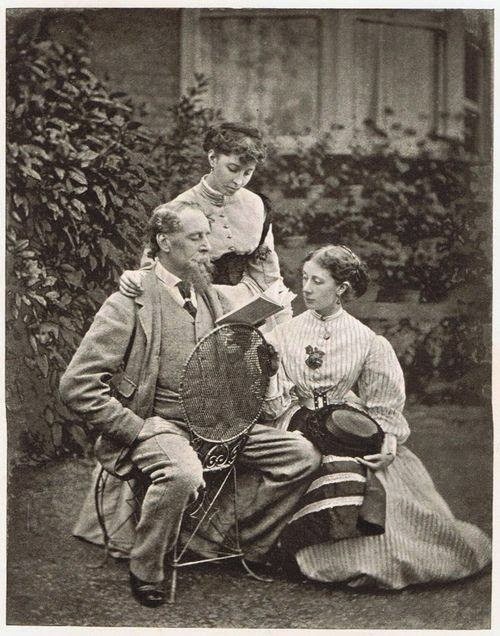 Charles Dickens reading to his daughters (Katie and Mamie) at Gad's Hill Place (1863). 6. DICKENS, Charles. Oliver Twist; Or, the Parish Boy’s Progress. London, 1838. Three volumes. Octavo, mid 20th-century full red morocco gilt. [$12,000]. First edition, first issue, of Dickens’ classic portrayal of “the miseries of the poor… [and] the phantoms of his own childhood” (Ackroyd, 219), with 24 plates by George Cruikshank including the suppressed “Fireside” plate and “Boz” title pages, handsomely bound. “Dickens turned in Oliver Twist to the novel of crime and terror… Humor is dimmed by gloomy memories of the author’s own neglected childhood” (Baugh et al., 1346-47). “When Bentley decided to publish Oliver in book form before its completion in his periodical, Cruikshank had to complete the last few plates in haste. Dickens did not review them until the eve of publication and objected to the Fireside plate which depicted Oliver at Rose Maylie’s knee [Volume III, p. 313]… Dickens had Cruikshank design a new plate… This Church plate was not completed in time for incorporation into the early copies of the book, but it replaced the Fireside plate in later copies… The plate and title page were changed between November 9 and 16” (Smith, 35). Scattered light foxing. A most handsome copy in very nearly fine condition. 7. DICKENS, Charles. Autograph letter signed. Tavistock House, October 23, 1852. One 9 by 7 inch leaf folded once to make four 4-1/2 by 7-inch pages, handwritten on two pages. [$7500]. Remarkable 1852 autograph letter signed by Charles Dickens to the matron in charge of his charitable Home for Fallen Women, regarding a prospective girl’s admission. In the Spring of 1846, Dickens proposed a charitable plan to Miss Burdett-Coutts, a millionaire philanthropist able to provide the funding to make his dream a reality. Dickens envisioned a “house in which girls from the streets, the prisons and the workhouses, girls who stole and prostituted themselves… might be changed through kindness and discipline, and so prepared for new lives in the colonies” (The Guardian). For the next 12 years Dickens meticulously and actively created and managed the Home for Fallen Women. The letter, entirely handwritten by Dickens, reads in part: “Tavistock House, Saturday evening, twenty-third October 1852. Dear Mrs. Morson, I think it is not worth while summoning the committee now... The case of which you send me a statement and the subject of which you saw, appears to be a good one. You may admit the girl, on her thorough understanding that she consents to going abroad... Faithfully yours, Charles Dickens.” Letter accompanied by a vintage cartede-visite photographic portrait of Dickens made in 1867 by J. Gurney & Son of New York. Letter mounted, on blank final page, to another sheet of paper. Signature ever so slightly faded. Near-fine condition. 8. DICKENS, Charles. Vintage albumen photographic portrait signed. London, 1858. Vintage oval albumen photographic print, measuring 5-1/2 by 8 inches, on original card stock; floated on linen and framed, entire piece measures 14 by 15-1/2 inches. [$37,500]. Large vintage albumen photographic portrait of Charles Dickens taken by George Herbert Watkins, signed on the mount by Charles Dickens. Likely one of only 25 extant, presented by Charles Dickens to his friend Albert Smith, the famous 19th-century writer and humorist, as well as the brother of his tour manager, Arthur W.W. Smith. This photographic portrait of Charles Dickens was taken by George Herbert Watkins at his London studio at 215 Regent Street. It is believed to have been taken between April and June of 1858, Dickens having refused an invitation for a sitting in December two years prior. Dickens wrote to Watkins on July 17, 1858 to say that he was glad to hear that the portraits had turned out so well and requested “five and twenty impressions for private friends.” On the mount is written: “This Portrait belonged to Albert Smith and was bought at the sale of his widow’s effects in June 1870. T. Lace Caley.” A journalist, Albert Smith was one of the most famous writers of his time. Notably, Smith adapted Dickens’ Cricket on the Hearth and The Battle of Life for the Lyceum Theatre. Smith and Dickens were also friends. Smith’s brother, Arthur, planned Dickens’ readings in 1858 and made arrangements for a second series, but died before they could be completed. Edges of mount restored, mild toning to image and mount. 14. TWAIN, Mark. A Tramp Abroad. Hartford, Connecticut and London, 1880. Octavo, publisher’s deluxe full black morocco gilt recased. [$6800]. First edition of Twain’s account of his walking trip through the Black Forest and the Alps, profusely illustrated. This copy one of very few bound in the publisher’s deluxe full morocco-gilt. 15. TWAIN, Mark. Following the Equator: A Journey Around the World. Hartford; New York, 1898. Royal octavo, original green cloth. [$22,000]. Very rare “Author’s Signed Edition” of Twain’s fifth and final travel book, one of as few as 60 copies issued, with Twain’s double signature on the limitation page. This special edition includes a portrait of Twain in a donkey cart, as well as a two-page facsimile of a letter penned by Twain to Mr. T.S. Frisbee regarding the donkey-cart picture, neither of which appear in the trade edition. “Following the Equator, Twain’s final travel book, resembles Innocents Abroad in having a clear narrative tracing an actual journey—the around-the-world lecture tour he undertook in 1895-96. The book has long sections on his voyage across the Pacific and Indian Oceans.” Often sober in tone due to Twain’s grief over the death of his daughter Susie, this is his “only travel book that makes no pretense that its narrator may be anyone other than Twain himself… Many passages are lifted directly from notebooks he kept during his travels” (Rasmussen). While the limitation page states that 250 signed copies were produced (this copy is unnumbered), Twain bibliographer Merle Johnson notes, “Mr. Walter Bliss informed me that no more than 60 copies of the special edition were ever bound, and there is a strong possibility that these were ‘bootlegged’ over the author’s objection” (Johnson, 67). Because of this, this signed limited edition is almost never seen. First published in 1897. BAL 3451. A fine copy of this exceptional Twain rarity. 16. TWAIN, Mark. The Adventures of Tom Sawyer. Hartford, 1876. Square octavo, original black- and gilt-stamped blue cloth rebacked with original spine laid down, custom half morocco clamshell box. [$25,000]. Originally published in England (without illustrations), Tom Sawyer arrived at a momentous point in American history: Custer had recently lost the battle at Little Big Horn and America was celebrating itsm centennial. “Publication of Tom Sawyer was little noticed… The book has, however, proved to be one of the most durable works in American literature. By the time of Twain’s death, it was his top-selling book” (Rasmussen, 459). “Surviving copies are proof of how rough little boys can be on books” (MacDonnell, 40). First printing, first state (with “THE” on half title in 10-point rather than 14-point type). BAL 3369. A few small spots of color, possibly added by a previous young owner, scattered light foxing and soiling, occasional short closed tears (including to frontispiece, not affecting image), marginal restoration to page 31 32, light rubbing and soiling to original cloth, expert restoration to spine ends and corners. A very good copy. 17. TWAIN, Mark. Works. New York, 1922-25. Thirty-seven volumes. Octavo, modern full burgundy morocco gilt. [$35,000]. “Definitive Edition” of Twain’s writings, one of 1024 sets with a specially prepared leaf signed by the author ( “S.L. 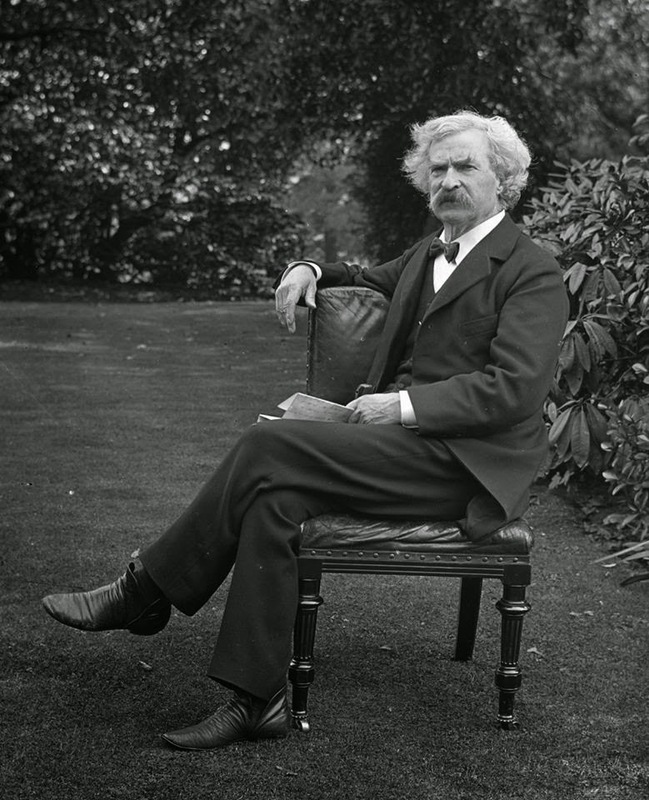 Clemens / Mark Twain”) in 1906 in Volume I, accompanied by a signed autograph letter entirely in Twain’s hand requesting books from a bookseller. This beautiful edition of Twain’s complete novels, essays and sketches includes, among other classics, A Connecticut Yankee in King Arthur’s Court, Life on the Mississippi, and the adventures of both Tom Sawyer and Huckleberry Finn, as well as Twain’s autobiography and Albert Paine Bigelow’s influential and long-standard biography of him. Illustrated with 174 plates. This copy is signed by editor Albert Bigelow Paine on a leaf opposite the leaf signed by Twain with the note that “This fly-leaf was signed by Mark Twain in 1906 in anticipation of the present definitive edition of his works.” Tipped into the first volume is a short letter from Twain entirely in his hand requesting books from a bookdealer. The letter reads in full: “July 3/97. Dear C & W: Please send me cheap editions of these? Amiel’s Journal. Dostoieffsky’s ‘Crime and Punishment’ (Vizitelly). The one-volume edition of ‘Green’s Short History of the English People.’ Yours SLC.” Interiors generally fine. 18. TWAIN, Mark. The Love Letters of Mark Twain. New York, 1949. Tall octavo, original black cloth, dust jacket, slipcase. [$11,000]. Signed limited first edition of Twain’s love letters to his wife, one of only 155 copies printed, with tipped-in limitation page containing Twain’s double signature: “S.L. Clemens, Mark Twain,” in original numbered slipcase. Although the book was not published until many years after Twain’s death, a printed notice on the limitation page reads, “These signatures of Mark Twain have been in the possession of Harper & Brothers for fifty years. There are no more.” Minor soiling to slipcase. Book fine, dust jacket about-fine. A beautiful signed copy. 93. (AFRICA) OGILBY, John. Africa: Being an Accurate Description of the Regions of Aegypt, Barbary, Lybia, and Billedulgerid, the Land of Negroes, Guinee, Aethopia... London, 1670. Folio (11 by 16-1/2 inches), period-style full mottled calf gilt. [$22,500]. First edition of the most authentic and comprehensive work in English on Africa published during the 17th century, superbly illustrated with engraved frontispiece, large folding map of the entire African continent, 12 double-page maps, 30 double-page copper-engraved views, nine full-page plates, and more than 40 in-text engravings by Hollar and others. Ogilby’s Africa is widely recognized as one of the finest English illustrated books relating to Africa. The text, drawn in part from that of Ogilby’s contemporary, Olfert Dapper, was the most extensive English account of that continent published to date. The primary value of the work, however, lies in its splendid maps, views, and plates, of which the work contains 53 altogether, and its extensive notes on the southern portions of Africa. In addition to the large folding map showing all of Africa, the twelve double-page maps include Egypt, Morocco, southern and western Africa, the Congo, Madagascar, and the Cape Verde and Canary Islands. professionally cleaned. An attractive copy. 100. CHARLES I. Basilika: The Workes of King Charles, The Martyr. London, 1662. Folio (9 by 14 inches), late 19th-century full gilt-paneled mottled calf gilt. [$8800]. First folio edition of the works of King Charles I—the enormously popular (and vainly suppressed) testament to the executed monarch’s political principles and spiritual devotion—the first edition directly approved by Charles II, beautifully printed with three magnificent double-page copper-engraved plates, engraved frontispiece (by Hollar) and title page, handsomely bound by Mansell. In late 1647, with tensions between Charles I and Parliament mounting, the king fled from Oliver Cromwell and the army. In November, he escaped “to the Isle of Wight, where he seems to have expected that Colonel Hammond, the governor of Carisbooke Castle, would protect him… Hammond, however, was faithful to his trust, and Charles became a resident, and before long a prisoner in the castle” (DNB). The next year, he would be tried and executed. “A few hours after the King’s execution, his Eikon Basilike was in the hands of the people… So marvelous was its effect, that contemporary authorities declare that nothing but the Government’s ingenious and persistent condemnations of the work prevented an immediate restoration of the crown”(Almack, 3). “Charles’ posthumous campaign of persuasion was perhaps the most successful he ever waged… By the end of the first year of the Commonwealth, ‘The King’s Book’ was everywhere, showing up like an irrepressible phantom, even in miniature editions designed for concealment” (Schama, History of Britain II:177). “The work is a masterpiece in its expression of Charles’ principles… and by making a martyr of this Stuart king, [it] exercised a considerable influence on English history” (Kunitz & Haycraft, 212), helping prepare the way for the 1660 Restoration of Charles II. This collection features the first royally sanctioned printing of the Eikon Basilike. Directly approved by Charles II and licensed exclusively to London printer Richard Royston, this majestic and wide-margined folio printing was seen as the finest production of the late king’s writings. Without the extra and frequently absent leaf bearing the epitaph “M.S. 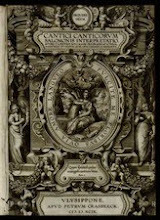 Sanctissimi Regis.” Without additional frontispiece, noted in some copies only. Armorial bookplate. Old owner signatures. Occasional light marginal soiling. Double page plate between pages 412 and 413 with expert marginal repair at bottom of gutter. Marginal repair to one leaf [2R4], not affecting text. Binding lovingly restored. 108. (ECONOMICS) MARX, Karl. Capital: A Critical Analysis of Capitalist Production. London, 1887. Two volumes. Octavo, period-style full tan calf gilt. [$17,000]. First edition in English of the first part of Marx’s landmark Das Kapital, the only part published in his lifetime, containing substantial revisions made by Marx for the first French translation, this two-volume work edited by Engels and translated from the third German edition. A very scarce and important printing of a seminal work in economic and political thought. 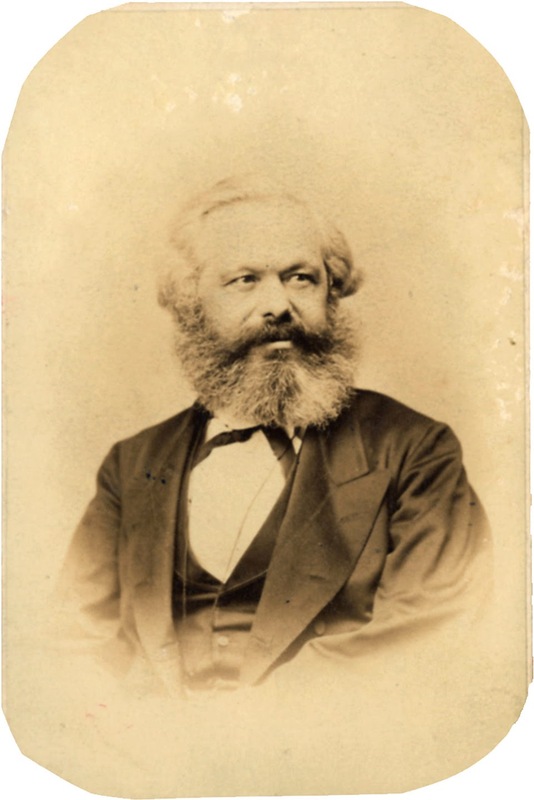 “Marx himself modestly described Das Kapital as a continuation of his Zur Kritik des Politischen Oekonomie, 1859. It was in fact the summation of his quarter of a century’s economic studies… The ‘Athenaeum’ reviewer of the first English translation (1887) later wrote: ‘Under the guise of a critical analysis of capital, Karl Marx’s work is principally a polemic against capitalists and the capitalist mode of production, and it is this polemical tone which is its chief charm’” (PMM 359). Only this first part of Marx’s magnum opus appeared in his lifetime, with its publication in German in 1867. The remainder was constructed by Engels from Marx’s posthumous papers. Containing Marx’s central concept of surplus value, this first edition in English is translated from the third German edition, edited by Engels and incorporates substantial revisions Marx made for the first French translation (1872-5). Text very fresh and clean. A fine copy. 119. BICKHAM, George. The Universal Penman; Or, the Art of Writing. London, 1733-41. Tall folio, 19th-century full black morocco. [$4800]. First edition, with an engraved frontispiece by Hubert Gravelot and 212 folio copper-engraved plates of rococo handwriting specimens, all fully engraved. “George Bickham was the most celebrated penman of his time” (DNB) and his Universal Penman was the most important calligraphic book of the 18th century. Bickham’s works “are distinctively English adaptations of the French rococo style that then dominated Europe” (Ray, 3). The Universal Penman was first issued to subscribers in 52 parts between 1733 and 1741 and was heavily used by its owners, making complete copies in fine condition very scarce indeed. Minor marginal soiling to first few and last few leaves, including frontispiece and title page. A handsome copy of this finely engraved work in near-fine condition. Com a leitura extensa destes dois preciosos catálogos conseguimos seguramente ter uma ideia da força do mercado bibliófilo nos USA. Claro que para nós ficará sempre a “água na boca” ou uma “sã inveja” como me diria um bom amigo. Saudações bibliófilas e continuação de boas leituras.